I do like a good murder, and the vicious stabbing of a handsome, popular US football player heralded a promising start. The novel is packed with familiar themes; the anti-social female detective with a complicated private life and severe health issues, the seemingly popular victim who has dark secrets, a drugs deal that goes horribly wrong, and a handsome, out-of-reach-because-he’s-married colleague. This is good thing when it provides anchorage for a plot that becomes quite involved. This book illustrates how hard it is to write a strong female character who is also sympathetic. The essential element, whether male or female, is that one thing which makes you care about them. With strong females especially, they have to work twice as hard to prove their worth. I sense the author wanted to show us how Stacy’s behavior and decisions came about because she was trying to “prove herself” and/or close the case at all costs. I just wish that her motivation was more sharp-focussed. With peripheral characters, the book seemed to pick up on the current US television trend for “love-to-hate” shows (eg., House of Cards) which are full of people with dubious qualities and ideals. The plot was nicely convoluted though, and held some genuine surprises. This would have been a much tighter, more compelling read with a bit of judicious pruning by the editors. Some of the descriptions of place were unnecessary, and forced my concentration away from the action. For example, I didn’t need to know the interior design of a supermarket, because it wasn’t relevant to the story. These chunks of prose, as well as some clunky dialogue, got in the way of what was shaping up to be a tensely-plotted whodunnit. Stacy had a tough perspective for me to get into, but in the end, the book is a solid crime drama, with a female character that doesn’t make excuses for how she is. I wouldn’t put other readers off getting to know Stacy, as long as they know what they’re going to get. 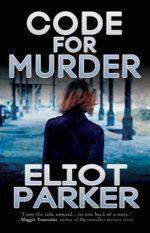 This week Eliot Parker joins the show to discuss his new release A Code for Murder, characters with flaws and drive, and then shares some advice for authors prepping for interviews based on his own experience as an interviewer! Eliot Parker is the author of three novels: Breakdown at Clear River, Making Arrangements, and Fragile Brilliance. He currently teaches writing and literature at Mountwest Community and Technical College in Huntington, West Virginia, and hosts the television show “Chapters” across the Armstrong Television Network, which profiles authors, editors, and publishers in West Virginia, Ohio, and Kentucky.